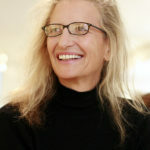 Annie Leibovitz is an American portrait photographer. She photographed John Lennon on the day he was assassinated, and her work has been used on numerous album covers and magazines. She became the first woman to hold an exhibition at Washington’s National Portrait Gallery in 1991. "No one ever thought Clint Eastwood was funny, but he was." "My lens of choice was always the 35 mm. It was more environmental. You can’t come in closer with the 35 mm." "There must be a reason why photographers are not very good at verbal communication. I think we get lazy." "Nature is so powerful, so strong. Capturing its essence is not easy – your work becomes a dance with light and the weather. It takes you to a place within yourself." "My hope is that we continue to nurture the places that we love, but that we also look outside our immediate worlds." "I’m more interested in being good than being famous."